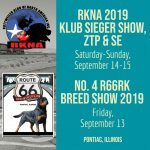 RKNA Ztp Dogs › Rottweiler Klub of North America Inc. The Ztp (Zuchttauglichkeitsprüfung) is designed to select those Rottweilers who are worthy of being bred. The dog’s conformation must be judged of breeding quality and free of disqualifying faults. The dog must have a passing hip rating, a BH degree and permanent identification (tattoo or microchip). Once the conformation and soundness qualifications have been met, the dog’s temperament is tested. This test includes a gun sureness test, a protection test, and a test to ensure the dog is stable around the public. The Rottweiler Klub of North America strongly believes that these tests are vital to maintaining the Rottweiler in type and temperament and should be the foundation of any breeding program. RKNA would like to congratulate Pat Nesbitt with his male, Prince Djuke v Evmann “Bruiser” for passing the first Körung and earning the title Gekört. Bruiser is the first Rottweiler in RKNA to achieve this elite award. Congratulations! The Körung is the second level of breed suitability test, selecting premium breed stock. The Körung is a breed suitability event with two levels: (1) First Körung and (2) Life Time Körung. Dogs must have a Ztp to enter plus meet other requirements found in the Policy Manual. The protection routine is the IPO 3 protection routine. First Körung – the title issued to dogs who pass is Gekört which is valid for two years. Second Körung – The title issued to dogs who pass is Gekört bis EzA (valid for breeding lifetime). To enter the Second Körung, two years must pass, and the dog must whelp/sire a certain number of litters where the pups must be free of disqualifying faults. When the two years have passed, the dog is eligible to enter the second Körung event called “Life Time Körung”.